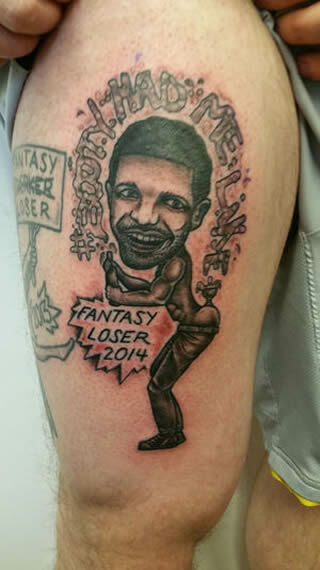 Let it be known that Dusty Carter did not choose his Miley Cyrus tattoo, nor did he choose the gigantic Drake tattoo that now covers his right thigh – his fantasy league did. According to the rules of the league, which consists of ten guys mostly from Omaha, the biggest loser at the end of the season has to get a tattoo chosen by the winner, which means the stakes are pretty darn high for Carter and his buddies. Unfortunately, Dusty Carter is apparently terrible at Fantasy Football, and he has landed in last place overall the past two years running, hence the fan girl ink. Dusty Carter’s new Drake tattoo was inked on January 30, at the Grinn & Barrett tattoo shop in Omaha, by resident tattoo artist Jeremiah Connor.